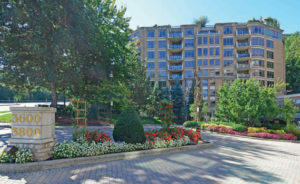 Prestigious Governor’s Hill By Tridel. Rarely Available West Facing Gracious Suite. Enjoy The Relaxing Lifestyle With 24Hr Concierge And Unparalleled Recreation Facilities. Residents Enjoy An Indoor Pool And Hot Tub, Gym, Squash Court, And Golfing Cage. There Are 8 Guest Suites. This Suite Has Been Well Designed To Include 3 W/I Closets, California Shutters, Hwrd Flrs & Large Eat In Kitchen. There Are 2 Large Storage Lockers.